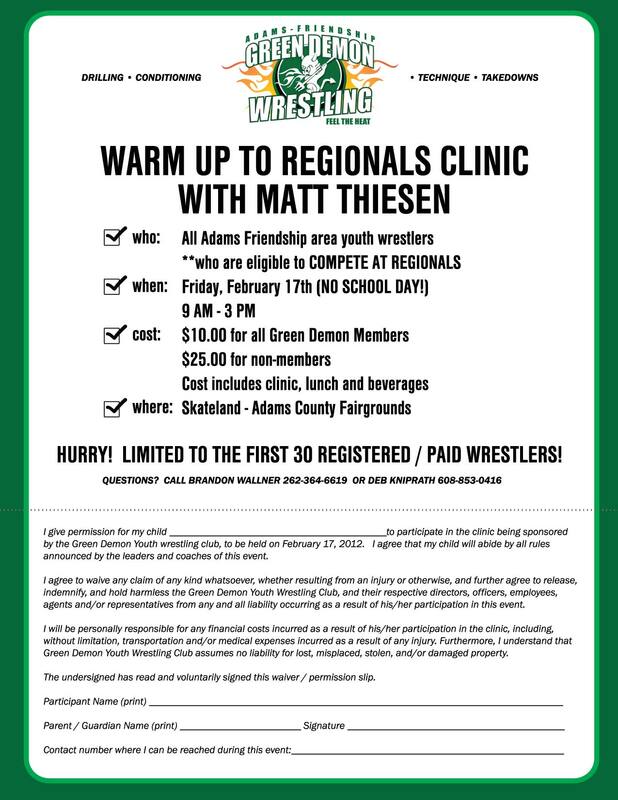 Wrestlers – we are hosting a WARM UP TO REGIONALS CLINIC next Friday, the 17th of February (Yes, that is a no school day!) for any area wrestler looking to get some extra mat time and work on conditioning, etc. Matt Thiesen will be working with up to 30 youth wrestlers at Skateland to help everyone prepare for the upcoming regional tournaments. There’s not a lot of time left before Regionals, and space is limited, so be sure to sign up early. Any questions, please contact Deb Kniprath or Brandon Wallner. ← TOURNAMENT WEEKEND IS COMING FAST!